Hey there! Today I finally put together a highly requested post, another Plan with Me! It has been a hot minute since I last shared any bullet journal content with you. I figured what better way to start September than with a monthly spread set-up? Below you'll find a simple explanation of each section of my September set-up, along with a time lapse video and a list of materials. And be sure to share your planner spreads in the comments below! I love seeing what you all create! I have switched up my planner style since the last plan with me post. For my past few spreads, I have been using a circular calendar to document the days of the month. I like it a lot more than the linear spread I previously used. I have more space to write now and the circular layout does not force me to plan in advance nearly as much as the linear spread did. If I forget any dates or a new event crops up, I do not have to worry about trying to fit it into my monthly layout. 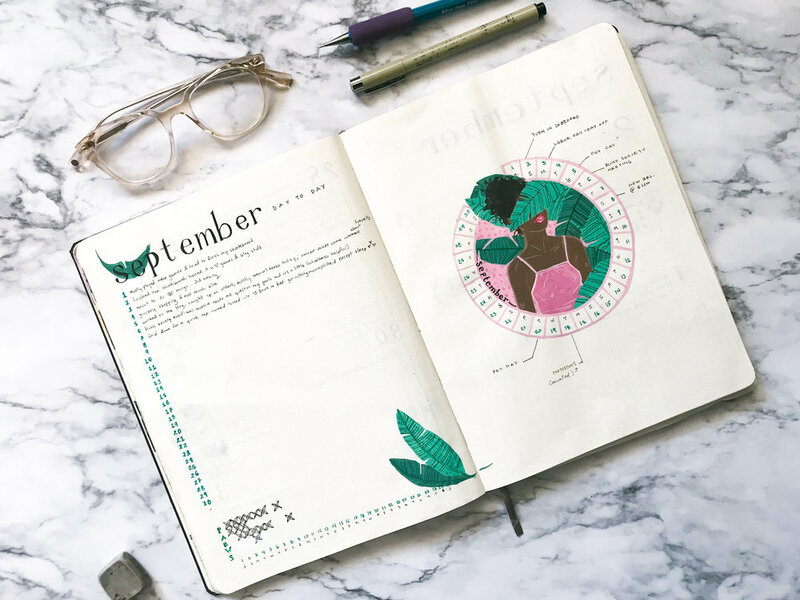 Many bujo-junkies draw flowers and plants as decorative illustrations on their spreads. Actually, I’d say most people draw foliage in their planner. And why not? It’s cute, it’s calming, it’s pretty. However, I am a bit bored with drawing poppies and leaves and the like. I aim to do more illustrations like I did last year, though with flat colors and simplified shapes. This is the first time I have painted in my bujo. I am pleased with the way the paint came applied. There was no real crinkling of the paper (pretty impressive as I did not prime the pages) and the paint did not bleed onto the next page. Also, the paint I used, acryla gouache, dries matte so there’s no plastic-y sheen like one gets acrylic. I like the muted color of it all with a few shiny highlights from the pens I used to add detail. My only complaint is my own illustration! This spread taught me that I need to plan out my doodle more—I mean, why in the world did I daw a woman in a tank top surrounded by tropical leaves when it’s fall!? Obviously I do not want to say goodbye to summer yet. I have migrated away from the end-of-the-month "reflection” and start-of-the-month “goals” pages (seen here) as they were not getting the love they deserved. I kept forgetting to set aside time to reflect on my month and it left me with tons of dead pages in my planner. Therefor, I have switched to a day-to-day spread where I write one sentence to summarize the days events. I used this template before I switched to my “reflection” and “goals” pages and it works great. Much easier to use if you do not have a ton of time! And that’s all I have for you! What about you? How do you set up your monthly planner spreads? Do you have a reflection/day-to-day page? Let me know in the comments below!